"As an equine dentist I am often called to horses experiencing dental problems"
Uneven wear can cause a molar to become extended thus impeding the horse's ability to grind its food, as well as causing damage to the opposing molars. Regular filing corrects tooth levels and enables normal wear and chewing ability. Molars can become fractured due to injury. This commonly leads to infection and in most cases requires extraction. Decayed molars are due to extensive periodontal disease. 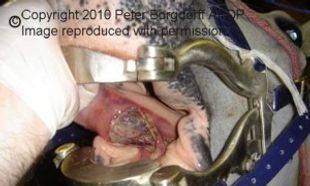 This is commonly seen in horses that have not had regular dental treatment. Sharp edges of the teeth cause feed to be retained in the mouth for long periods of time which results in gum disease and eventual tooth loss. 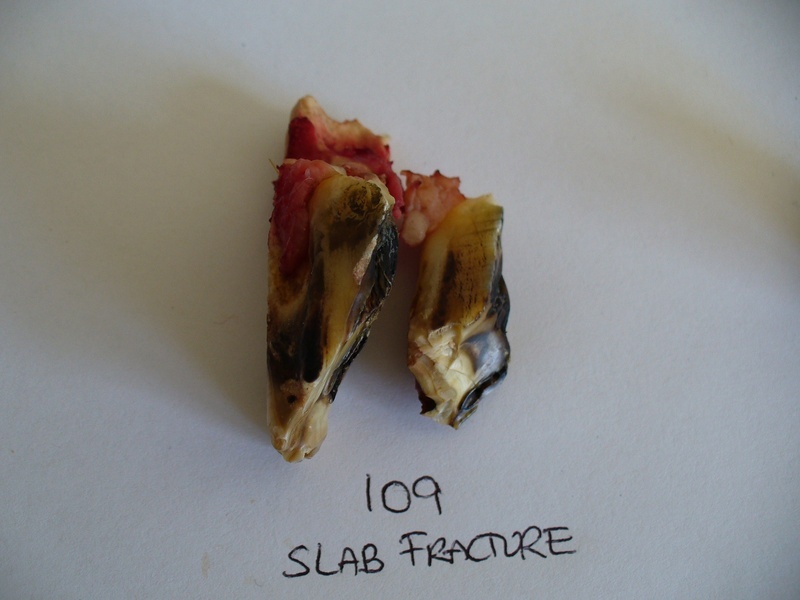 Decayed molars are extracted from horses as the ongoing infection associated with a loose molar is a significant strain on the system, causing weight loss, pain and difficulty eating. Regular dental treatment will prevent the problems which lead to decayed molars, this is a great advantage to your horse as it ages. 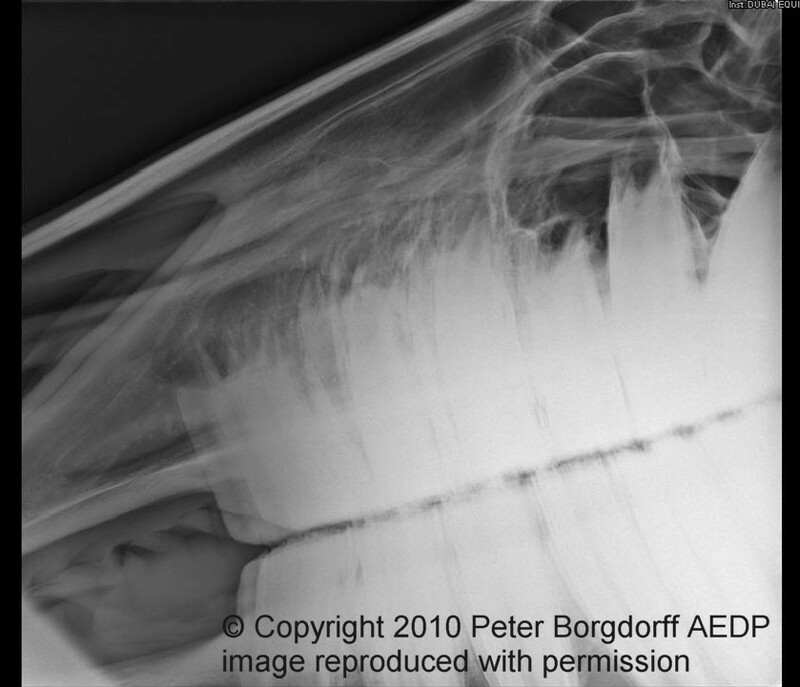 It is important to regularily check deciduous incisors in all horses aged 2-5 years as incisors can be retained, resulting in the displacement of permanent incisors. 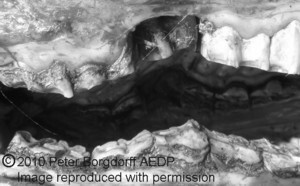 Incisor caps are extracted from young horses to enable proper eruption of the adult teeth. Working in collaboration with Vet Jude Mulholland of FarrierVet. BELLA is a 2 year old thoroughbred RSPCA rescue horse with a severe parrot mouth. As the roots of the molars extend significantly below gum level, Xrays can be a useful in complex cases. I work in conjunction with vets across the district in treating special cases. These cases are often referred to me by vets. Treatment may be in the paddock or at the Vet clinic and will usually require sedation or in rare cases GA.
PREVENTION THROUGH PROPER DENTAL CARE WILL HELP YOUR HORSE MAINTAIN A HEALTHY MOUTH AS IT AGES! 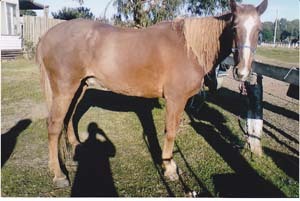 I see many aged horses once signs of serious problems develop. Weight loss, feed dribbling and infection are common symptoms of dental issues. Older horses that have not had regular dental treatment may require molar extractions, or can have uneven molar levels, resulting in an impeded ability to grind dry grass or hay. I work with horse owners in developing a feeding plan for their older horse in order to help them maintain their condition. With some extensive dental treatment and feed advice 27 year old "Charison" is still being ridden and takes part in the annual Barmah muster. PROPER DENTAL TREATMENT IS CRITICAL IN SMALL HORSES! 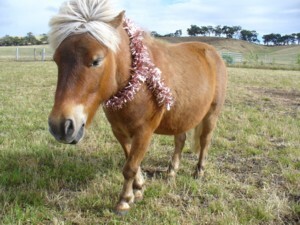 Selective breeding for smallness in ponies and miniatures causes congenital problems with the teeth of these equines. This is due to the increasingly restricted space available to accomodate a full set of teeth, the same in number as a larger horse. Overcrowding can cause lack of proper wear due to a restricted ability to grind. Razor sharp edges develop, causing cheek lacerations and long term feed retention in the cheeks.